Authentic meals from the sands of Egypt. And no, camel is not on the menu. Starting out as a humble food truck in 2015, Camel Grill has established itself as one of Wellington's best kebab establishments. Renowned for recipes as ancient as the sands of Egypt, expect to be served some deliciously delectable eats that will have you coming back time and time again. 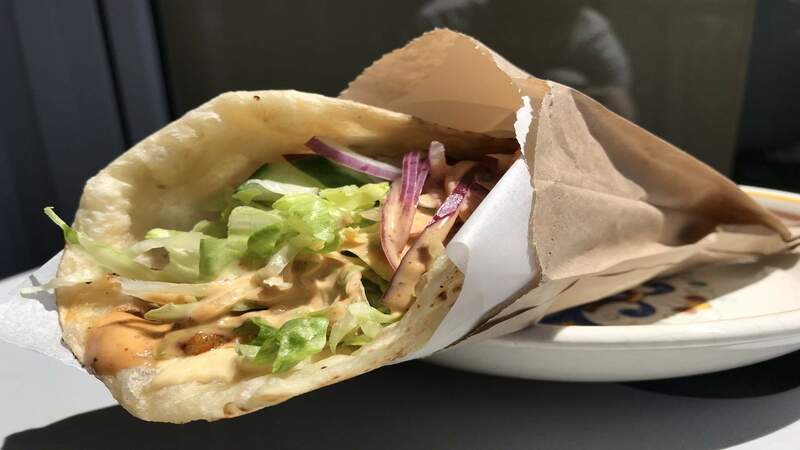 Finding its permanent hole-in-the-wall on Dixon Street, Camel Grill has set up shop to serve you some of the most deliciously authentic Egyptian and Mediterranean food, and no, camel is not on the menu. If I told you that some of Wellington's best kebabs were found squashed between Dream Girls and Eva Beva, you'd think I had lost my marbles. Walking up Manners Street, and right opposite the ever-entertaining Pigeon Park is Camel Grill — an unassuming, simple kebab shop that you wouldn't bat an eye at. But let me tell you, this is one of the capital's best kept secrets. Bopping to the Arabic pop tunes meandering from the speakers, I glanced up at the menu to see shawarmas and falafel, baklava and basbousa cake — even their very own "Dream Girls Burger". The smell of the freshly prepared food was overwhelming and set my mouthwatering into overdrive. I ordered my personal favourite, a chicken shawarma ($10) and a hefty slice of baklava ($4). Who knew that nirvana could be achieved for a measly $14? A fresh, handmade flatbread topped with creamy hummus, fresh cut veges, sensationally seasoned, succulent chicken and a generous drizzle of their house-made paprika sumac aioli. This shawarma messed me up (in the best possible way). Of course, I had to dabble in dessert and the baklava was a dense and crunchy parcel of nuts drowned in honey and syrup. Pure perfection. What I loved most about Camel Grill is just how authentic it was. The owner, Abdalla, has so much passion for Camel Grill and this is shown through the quality of the ingredients he uses. Drawing on traditional dishes from his childhood in Egypt, as well as his experience cooking around the world, he has mastered his craft to create food that is bursting with care and love. The handmade flatbread was certainly a highlight for me — a little bit doughy, exceptionally tasty and unbeatably fresh. Truly one of the best kebab joints in town, Camel Grill is waiting for you to try it. Open from Tuesday through to Sunday, pop in on your lunch break, or pick up a quick kebab if you're going for a stroll through the city. What's best, Camel Grill is open really late on Friday and Saturday nights (closes at three in the morning) to help keep those pesky after-town hunger pains away.